Tips for Choosing the Right Cookware for Your Range. When shopping for cookware, you might be shocked to find that cookware sets are priced between $29.99 and $999. This huge price gap leaves many consumers wondering, does the quality of my cookware really matter? The answer isn’t exactly black and white: the quality of your cookware matters in some cases, but it depends on the results you’re trying to achieve. If you’re not much of a cook and only plan to scramble some eggs and heat up simple dishes, then a lower cost option will suit your needs just fine. However, if you are planning to do a lot of from-scratch cooking with fresh ingredients, then investing in higher quality cookware will make a big difference. A big difference between expensive and inexpensive cookware comes down to the quality of the product’s materials and construction. 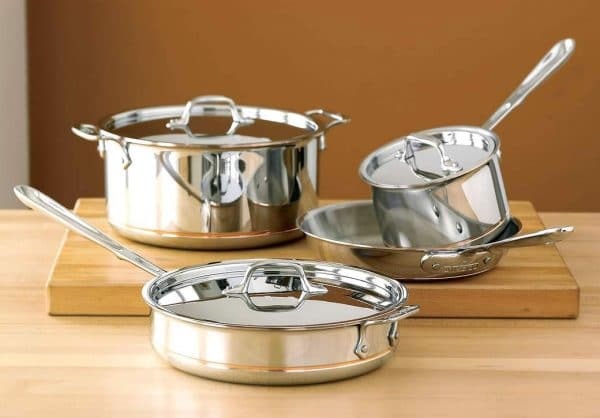 If you want to cook dishes evenly, you’ll need to invest in a quality cookware set. Inexpensive cookware sets are notorious for uneven heat distribution, which results in dishes that are partially over or under cooked (yuck!). To get the very best even heat, consider stainless steel cookware with an added inner core made of copper or aluminum, which improves the heat conductivity. You might also look into All-Clad cookware sets. All-Clad cookware is the most expensive, but you will get the best results. When shopping for cookware, look for heavy-gauge pans, as these deliver heat more evenly. Many dishes require “browning” on the cooktop and then transfer to the oven. Inexpensive, low-quality cookware made with plastics and certain non-stick coatings won’t work in your oven. If you want to have the perfect cookware for delicious stews, roasts, and chilis, consider looking for a high-quality dutch oven. If your budget allows for high-end cookware, we say that it’s well worth the investment. A good quality cookware set will last you for 10-20 years, while a low-quality set may only last for 2-3 years. If you consider that you’ll need to replace your bargain cookware set every 3-2 years, an All-Clad set is the way to go in the long term. Plus, with the high-quality option, you’ll have cookware that gives you great cooking results!